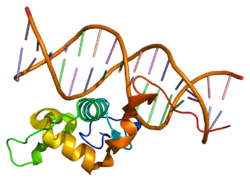 The neuron-derived orphan receptor 1 (NOR1) also known as NR4A3 (nuclear receptor subfamily 4, group A, member 3) is a protein that in humans is encoded by the NR4A3 gene. NOR1 is a member of the nuclear receptor family of intracellular transcription factors. Neuron-derived orphan receptor 1 has been shown to interact with SIX3. ↑ Hedvat CV, Irving SG (Dec 1995). "The isolation and characterization of MINOR, a novel mitogen-inducible nuclear orphan receptor". Molecular Endocrinology. 9 (12): 1692–700. doi:10.1210/me.9.12.1692. PMID 8614405. ↑ Pearen MA, Ryall JG, Maxwell MA, Ohkura N, Lynch GS, Muscat GE (Nov 2006). "The orphan nuclear receptor, NOR-1, is a target of beta-adrenergic signaling in skeletal muscle". Endocrinology. 147 (11): 5217–27. doi:10.1210/en.2006-0447. PMID 16901967. ↑ Pearen MA, Myers SA, Raichur S, Ryall JG, Lynch GS, Muscat GE (Jun 2008). "The orphan nuclear receptor, NOR-1, a target of beta-adrenergic signaling, regulates gene expression that controls oxidative metabolism in skeletal muscle". Endocrinology. 149 (6): 2853–65. doi:10.1210/en.2007-1202. PMID 18325999. ↑ Nomiyama T, Nakamachi T, Gizard F, Heywood EB, Jones KL, Ohkura N, Kawamori R, Conneely OM, Bruemmer D (Nov 2006). "The NR4A orphan nuclear receptor NOR1 is induced by platelet-derived growth factor and mediates vascular smooth muscle cell proliferation". The Journal of Biological Chemistry. 281 (44): 33467–76. doi:10.1074/jbc.M603436200. PMC 1829169 . PMID 16945922. ↑ Laflamme C, Filion C, Bridge JA, Ladanyi M, Goldring MB, Labelle Y (Jan 2003). "The homeotic protein Six3 is a coactivator of the nuclear receptor NOR-1 and a corepressor of the fusion protein EWS/NOR-1 in human extraskeletal myxoid chondrosarcomas". Cancer Research. 63 (2): 449–54. PMID 12543801. ↑ Ohkura N, Ohkubo T, Maruyama K, Tsukada T, Yamaguchi K (2001). "The orphan nuclear receptor NOR-1 interacts with the homeobox containing protein Six3". Developmental Neuroscience. 23 (1): 17–24. doi:10.1159/000048692. PMID 11173923. Ohkura N, Hijikuro M, Yamamoto A, Miki K (Dec 1994). "Molecular cloning of a novel thyroid/steroid receptor superfamily gene from cultured rat neuronal cells". Biochemical and Biophysical Research Communications. 205 (3): 1959–65. doi:10.1006/bbrc.1994.2900. PMID 7811288. Clark J, Benjamin H, Gill S, Sidhar S, Goodwin G, Crew J, Gusterson BA, Shipley J, Cooper CS (Jan 1996). "Fusion of the EWS gene to CHN, a member of the steroid/thyroid receptor gene superfamily, in a human myxoid chondrosarcoma". Oncogene. 12 (2): 229–35. PMID 8570200. Labelle Y, Zucman J, Stenman G, Kindblom LG, Knight J, Turc-Carel C, Dockhorn-Dworniczak B, Mandahl N, Desmaze C, Peter M (Dec 1995). "Oncogenic conversion of a novel orphan nuclear receptor by chromosome translocation". Human Molecular Genetics. 4 (12): 2219–26. doi:10.1093/hmg/4.12.2219. PMID 8634690. Ohkura N, Ito M, Tsukada T, Sasaki K, Yamaguchi K, Miki K (Sep 1996). "Structure, mapping and expression of a human NOR-1 gene, the third member of the Nur77/NGFI-B family". Biochimica et Biophysica Acta. 1308 (3): 205–14. doi:10.1016/0167-4781(96)00101-7. PMID 8809112. Ohkura N, Ito M, Tsukada T, Sasaki K, Yamaguchi K, Miki K (Apr 1998). "Alternative splicing generates isoforms of human neuron-derived orphan receptor-1 (NOR-1) mRNA". Gene. 211 (1): 79–85. doi:10.1016/S0378-1119(98)00095-X. PMID 9573341. Labelle Y, Bussières J, Courjal F, Goldring MB (May 1999). "The EWS/TEC fusion protein encoded by the t(9;22) chromosomal translocation in human chondrosarcomas is a highly potent transcriptional activator". Oncogene. 18 (21): 3303–8. doi:10.1038/sj.onc.1202675. PMID 10359536. Panagopoulos I, Mencinger M, Dietrich CU, Bjerkehagen B, Saeter G, Mertens F, Mandahl N, Heim S (Dec 1999). "Fusion of the RBP56 and CHN genes in extraskeletal myxoid chondrosarcomas with translocation t(9;17)(q22;q11)". Oncogene. 18 (52): 7594–8. doi:10.1038/sj.onc.1203155. PMID 10602519. Sjögren H, Wedell B, Meis-Kindblom JM, Kindblom LG, Stenman G, Kindblom JM (Dec 2000). "Fusion of the NH2-terminal domain of the basic helix-loop-helix protein TCF12 to TEC in extraskeletal myxoid chondrosarcoma with translocation t(9;15)(q22;q21)". Cancer Research. 60 (24): 6832–5. PMID 11156374. Liu D, Jia H, Holmes DI, Stannard A, Zachary I (Nov 2003). "Vascular endothelial growth factor-regulated gene expression in endothelial cells: KDR-mediated induction of Egr3 and the related nuclear receptors Nur77, Nurr1, and Nor1". Arteriosclerosis, Thrombosis, and Vascular Biology. 23 (11): 2002–7. doi:10.1161/01.ATV.0000098644.03153.6F. PMID 14525795. Rius J, Martínez-González J, Crespo J, Badimon L (Apr 2004). "Involvement of neuron-derived orphan receptor-1 (NOR-1) in LDL-induced mitogenic stimulus in vascular smooth muscle cells: role of CREB". Arteriosclerosis, Thrombosis, and Vascular Biology. 24 (4): 697–702. doi:10.1161/01.ATV.0000121570.00515.dc. PMID 14962944. Hisaoka M, Okamoto S, Yokoyama K, Hashimoto H (Jul 2004). "Coexpression of NOR1 and SIX3 proteins in extraskeletal myxoid chondrosarcomas without detectable NR4A3 fusion genes". Cancer Genetics and Cytogenetics. 152 (2): 101–7. doi:10.1016/j.cancergencyto.2003.11.011. PMID 15262426. Laflamme C, Filion C, Labelle Y (Dec 2004). "Functional characterization of SIX3 homeodomain mutations in holoprosencephaly: interaction with the nuclear receptor NR4A3/NOR1". Human Mutation. 24 (6): 502–8. doi:10.1002/humu.20102. PMID 15523651. Rius J, Martínez-González J, Crespo J, Badimon L (Feb 2006). "NOR-1 is involved in VEGF-induced endothelial cell growth". Atherosclerosis. 184 (2): 276–82. doi:10.1016/j.atherosclerosis.2005.04.008. PMID 15949808. Pei L, Castrillo A, Chen M, Hoffmann A, Tontonoz P (Aug 2005). "Induction of NR4A orphan nuclear receptor expression in macrophages in response to inflammatory stimuli". The Journal of Biological Chemistry. 280 (32): 29256–62. doi:10.1074/jbc.M502606200. PMID 15964844. Bonta PI, van Tiel CM, Vos M, Pols TW, van Thienen JV, Ferreira V, Arkenbout EK, Seppen J, Spek CA, van der Poll T, Pannekoek H, de Vries CJ (Oct 2006). "Nuclear receptors Nur77, Nurr1, and NOR-1 expressed in atherosclerotic lesion macrophages reduce lipid loading and inflammatory responses". Arteriosclerosis, Thrombosis, and Vascular Biology. 26 (10): 2288–94. doi:10.1161/01.ATV.0000238346.84458.5d. PMID 16873729. Pearen MA, Ryall JG, Maxwell MA, Ohkura N, Lynch GS, Muscat GE (Nov 2006). "The orphan nuclear receptor, NOR-1, is a target of beta-adrenergic signaling in skeletal muscle". Endocrinology. 147 (11): 5217–27. doi:10.1210/en.2006-0447. PMID 16901967. Pearen MA, Myers SA, Raichur S, Ryall JG, Lynch GS, Muscat GE (Jun 2008). "The orphan nuclear receptor, NOR-1, a target of beta-adrenergic signaling, regulates gene expression that controls oxidative metabolism in skeletal muscle". Endocrinology. 149 (6): 2853–65. doi:10.1210/en.2007-1202. PMID 18325999. Vacca M, Murzilli S, Salvatore L, Di Tullio G, D'Orazio A, Lo Sasso G, Graziano G, Pinzani M, Chieppa M, Mariani-Costantini R, Palasciano G, Moschetta A (Jun 2013). "Neuron-derived orphan receptor 1 promotes proliferation of quiescent hepatocytes". Gastroenterology. 144 (7): 1518–1529.e3. doi:10.1053/j.gastro.2013.02.027. PMID 23462179.